Our Bible Reading Schedule takes you through the entire Word in a year, in about 20 minutes a day. Why Should You Read the Entire Bible Every Year? explains why it is vital to read God's Word systematically. 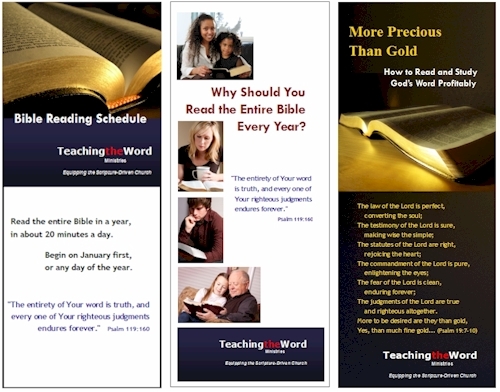 More Precious Than Gold: How to Read and Study God's Word Profitably explains how to get the most out of your commitment to read the Word. Each kit is shipped individually packaged for mailing, bulletin insertion, or hand distribution. Please note: The kit does not include a Bible. To request a FREE PERSONAL copy of the Bible Reading Challenge Kit - click here.